With a million people arriving in Atlanta for a weekend of Super Bowl fun, security’s tight everywhere you go. With the entire world watching, law enforcement officials know they can’t afford to skip any detail. 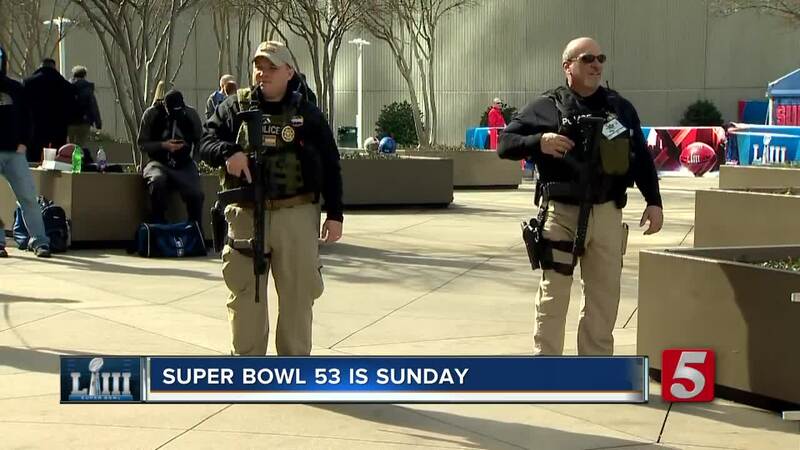 ATLANTA (WTVF) — With a million people arriving in Atlanta for a weekend of Super Bowl fun, security’s tight everywhere you go. With the entire world watching, law enforcement officials know they can’t afford to skip any detail. With 15 official event sites where teams and fans will gather throughout the week, securing Super Bowl 53 has been an around the clock job involving 40 different agencies including the Department of Homeland Security. The hard work this month came even as some employees missed paychecks due to the government shutdown. And the plan has worked. Atlanta Super Bowl security has already led to the arrest of 33 people for human trafficking and the rescue of four victims. But with the greatest risk for crime and terrorism coming with the increased weekend crowds, officials will remain on high alert. Nashville’s lending a hand to the security detail. Two Nashville International Airport K-9 teams are here - with Aaron Battle and Bingo and Thomas Johnson and Wolf sniffing out any trouble.